Iowa native Captain Nick Turner. A southwest Iowa native who grew up flying along with his dad in the family helicopter business is now flying in the most famous helicopter in the world. Nick Turner graduated from Griswold High School, went to Central College where he played football before graduating and joining the Marines. Turner knew he wanted to be a pilot after flying with his dad Larry at Turner Copter Services in Elliot, and after two tours in Iraq and one in Afghnistan, he decided to apply to join the squadron that transports the president. He says the toughest part of qualifying for most people is the extensive background check that must show a clean record. Turner says there was a requirement that you had to have a minimum of 1,500 flight hours, which he says was easy after being deployed and serving six years in Hawaii flying helicopters. But he says the toughest part for most is the requirement that your record be clean. Turner says the background check on pilots is extensive. He says you can’t have any skeletons in your closet and they go back seven to 10 years and want to find out your character and who you are. “If they are going to trust you with the most important man in the world, they’ve got to know you are on their side,” Turner says. Turner says things the seem minor like traffic tickets can count against you. Turner found out in 2009 that he would be joining the elite group of pilots in what’s known as the H-M-X-1 Squadron. Turner says all of the pilots are above average in skill when it comes to being a pilot and being able to think on the move. He says it is a neat place to be and a great place to learn. Turner is a co-pilot on flights aboard Marine One that include the president, and is the pilot for other government officials. Turner flies two or three times a week, and the rest of his time is spent as a schedule writer. He says the job keeps him busy and he is away from home around 200 days out of the year. Turner says the tough part is that he very rarely gets much heads up when he is going to be gone, unlike a fleet squadron where you know your schedule better. He says sometimes he is given 24-hours notice before he will leave. Turner credits his wife Kimberly with being understanding about the assignment and taking care of his four kids while he is away from home. Kimberly is a Colo native. Turner now flies as a co-pilot, but hopes to be able to some day move over to the other seat. He says it’s like high school where you have your freshman, sophomore, junior and senior year. He’s just ending his freshman year and will move up to the point where he becomes a “White House hack” as junior, where you carry everyone but the president. 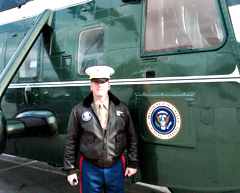 Sitting at the controls of Marine One with the Commander in Chief on board is the ultimate goal. Turner says it’s the most coveted position in the squadron as anyone can serve as a co-pilot, but only five are chosen to be the pilot. The five Marine One pilots choose their successors as they rotate out of the position. Turner says he did a lot of fun things while flying with his dad Larry back in Iowa, but this experience has topped all that. He says they built the Desert Dome at the Henry Dorley Zoo in Omaha, they flew Elton John to Hilton Coliseum for a concert in Ames after putting carpet in their helicopter. “You know it was pretty cool to do some of those things, but I never thought in a million years I’d get an opportunity — you know a small-town Iowa farm kid — to do what I’m doing now, (I’ve) been very blessed,” Turner said. Turner has seen the president on a few flights. Turner says the president always sticks his head into the cockpit and shakes their hands when he comes aboard and thanks them. “He always gives us a wink or a nod and lets us know he appreciates what we do, which I definitely like, it’s pretty neat,” Turner says. Turner says he had the chance to fly the First Lady during a trip to India. Turner says he’ll return to a regular squadron once his four years is up with the current assignment. He would like to return to Iowa once he retires from the Marine Corps.